OK, I’m running a day behind now, but yesterday was a crazy day. The plumber was here and he couldn’t get the sink to fit once it had the faucet and other parts attached. So he had to cut away parts of the countertop. Whoever built this house jury-rigged pieces of wood together to hold up the cast iron sink. Yes, cast iron. I can only imagine how heavy that thing was. At least it’s gone now. Anyway, the plumber was getting very upset and grouchy and it was making me uncomfortable, especially when he started swearing. I’m normally OK with a little swearing, but I don’t like angry men swearing in my house when I’m alone. (DH had to work.) It made me cringe, so it must have triggered the fear factor I get when men are angry (probably PTSD from an abusive relationship). Needless to say, I was very relieved when they left even if it was in a huff. The tile guy went by Lowes yesterday to pick up my tile and they didn’t have it. They told him it was on order. The reason why it was on order is because we bought the last of it off the shelf. I watched them pick it up and put it in the cart. They put the cart in the back where they store things for pickup later. It took two employees all day looking for that tile in order to find it. Someone had shoved three appliances up around the shopping cart holding my tile (bright, eh?) but at least they found it by the end of the day. So not a lot got done yesterday, but tempers did flare. I wish I could be more assertive in situations like that and not let it get to me. I didn’t like how the lead plumber treated his assistant either, who was rather nice. The plumbers are done today and I am so glad to have them out of the house. The tile folks are still working, but I like them. They are very nice and do great work. We’re almost done. Well, there really wasn’t much to say about days 7 & 8. On Sunday, they cleaned up everything and put everything back. 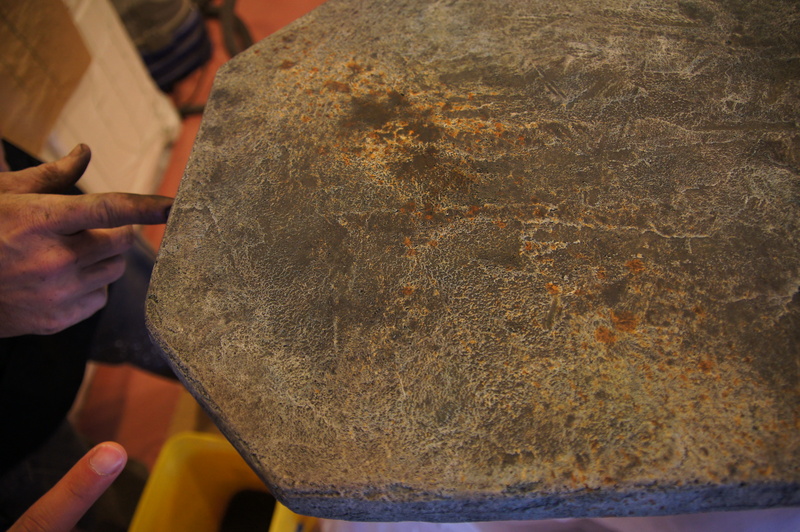 They put the final coat on the hearth, which is thicker than originally anticipated to make it more durable. 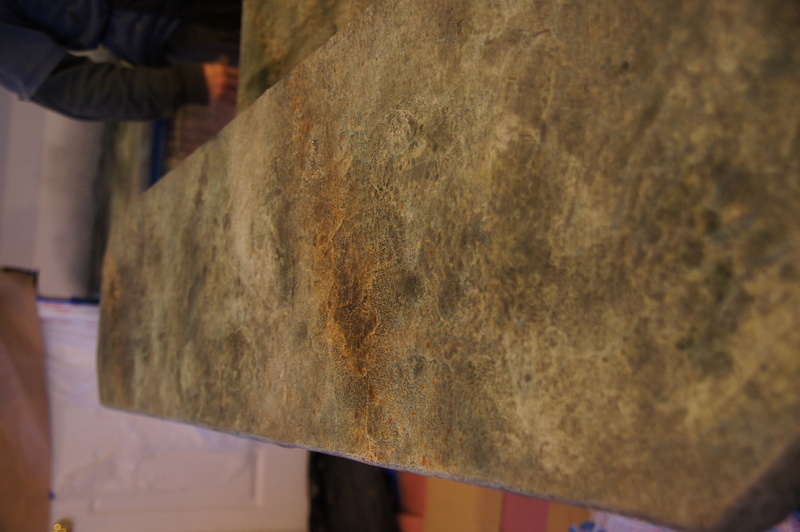 We came home Sunday night to the most gorgeous countertops you can imagine! They are concrete, but look like stone. Varying shades of green ranging from emerald to forest, with traces of copper streaks as if a creek bed had run through it. Glossy and beautiful, I couldn’t stop touching the bar area it was so unreal. On Monday, nothing happened with the house. It was a long and frustrating day, waiting for news of tile guys and plumbers. Finally, today both will be here, as well as the carpet guy. It’s like a party here! 😉 The electrician is missing out, he won’t be here until next week. On a personal note, I saw my psychiatrist yesterday. I told her I was concerned that I was on too high a dose of Paxil, so we cut it back and my Geodon is cut back to 80mg. The reason the Geodon got cut back is because when I went to fill the 20mg script (I take 100mg total), they told me the medication was going to be over $1000!!! (I haven’t met my deductible yet.) Isn’t that crazy?! It goes generic next month so if I hold off for a bit (psych is ok with this) maybe we can afford it again. This morning, DH & I were talking about the hearth we had seen before we left. We weren’t crazy about it but it was still better than what we had so we figured just not to worry about it. Shortly thereafter, I get a call from the contractor: can we redo your hearth? He said he didn’t like it and didn’t want his name associated with it, but if we really liked it he would leave it. We told him it was fine to redo it and even talked a bit about the color. This should be a nice surprise when we get home. DH wants a new stove. I want new carpet. I really want to redo the bathroom. This remodeling stuff never ends! By the time you finish what you want to do, its time to start over. Home decor is such a fashion industry. I can’t wait to get home tomorrow. We are having fun up here but I want to see my new counters and I miss my kitties. I’ll post when I’ve seen them! I’ll post more later. Gotta get on the road now! Today’s issue? The sink. They had to try out the sink to see if it would fit before concreting the counters. Well, it didn’t. The old kitchen sink was cast iron and the builder had put in some extra pieces and braces to make it fit. 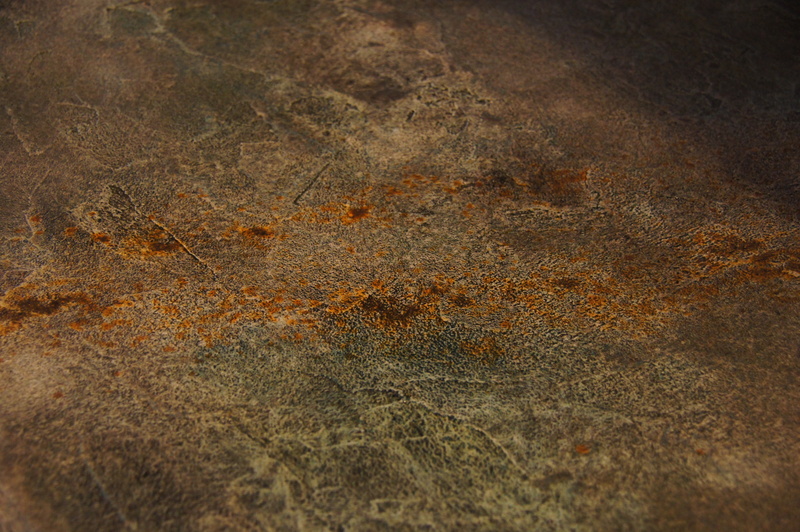 He also never sealed the sink, so we had rust under the lip of it around the edge of the counter. The supplier couldn’t leave until we had the sink sorted out, and the builder had to come over and look at it because the workman didn’t want to make the call on his own. (Don’t blame him.) So we have 5 people (the builder, the workman, the supplier, DH & I) and one uncooperative sink. Although this sink wasn’t nearly as uncooperative as the original appears to have been. The final solution was to remove the braces that were put in for the old sink and cut notches into the counter to allow for the clamp mounts fit and the sink would drop in. Not sure how they will clamp it now, but they will figure something. Also they said they would seal it. BTW, who the hell puts in a sink without sealing it??? Sink problem fixed. 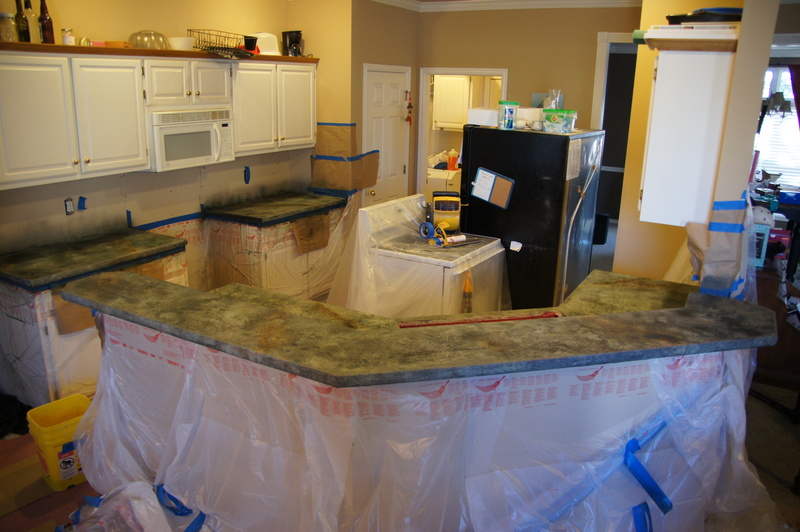 The counters got the final coat of concrete. The texture looks amazing – just like slate. I can’t wait to see how the color will work out. The hearth is textured the same way but it will be brown. Already replaced the knobs in the living room on the built-in. Bought the tile at Lowes. Need a date from the tile guys so I can schedule the electrician. Then I don’t know whose house I will be living in, because it will look way too cool to be mine. OK, I started this post this morning when I was tired, frustrated, and had just dropped the kitties off at the kennel. Things have changed dramatically since then, so I am re-writing this now that I am calmer and some things have been resolved. The problem we have been having is with tile. Because the counters are going to be custom and unique works of art, we have to pick tile to go with the counters or at least what the counters will be most like. We went to the local tile store yesterday, and while they have a huge selection, it’s actually difficult to find something that works. Marble would have been $9/ sq. ft. The travertine was nice and would have gone but they only make it in 4×4. They had some larger sizes but not in the same color. Doing 4×4 tiles would have made everything infinitely more complicated but I was determined because I don’t like the look of the larger tile. DH & I were fighting over tile with both of us getting very frustrated and upset. We took a break, took the dog to the dog park and ate lunch. Tempers receded. 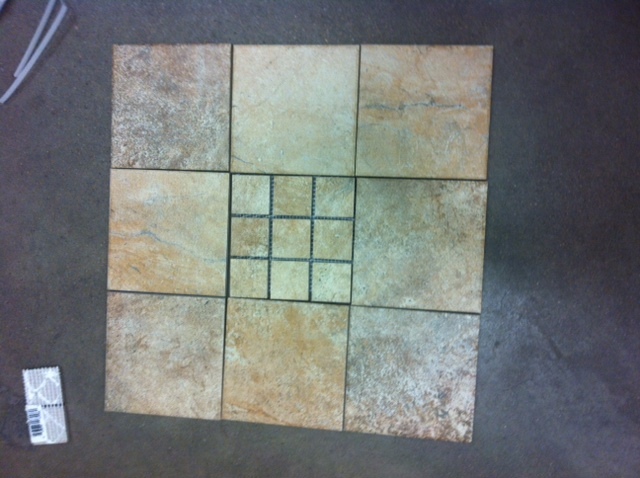 They make a 12×12 version of the tile as well that we can use in the living room. It will tie the two rooms together subtly, which is nice because it’s sort of an open-concept design. (I can watch TV while doing dishes, for example.) So finally we agree on a tile! Thank goodness because I am SO sick of this decision making crap. The workman made some headway on the countertops and hearth. He had to spend a lot of time laying down plastic and cardboard to protect everything. But I would rather have them do that than to spill on my current carpet or tile. These guys are good – they even clean up after themselves! Cross your fingers that this tile business is behind us (except for writing the check) and we just have to have faith that the rest of it will work out as planned. I cannot wait to see the finished product! That pretty much sums up today. Going out to have dinner soon – we can’t cook anymore (no stove & no pots/pans/dishes/etc.) It’s going to be a long week in the food department. It’s going to be a long week, period. I can’t wait until I have my kitchen back, and more importantly, my kitties home again. Well, I think we are a day behind. The sink was supposed to come out today but instead we got the tile removed and the backsplash area re-drywalled. So tomorrow is the day real work begins. We lose the sink, everything gets taped off and maybe concrete gets poured. Then staining and epoxy on Friday. Hopefully. We are supposed to go away on Friday & Saturday so we don’t interfere with the drying process. Hopefully things come back on Monday (sink & tile) then we can have the electrician in for the lights. The carpet guys have to come put our carpet back too. Another cost because I can’t afford to replace our crappy carpets yet. It all adds up so quickly. My angels go to the kennel in the morning. I will be sad without them, but they need to be out of the way for the rest of the remodel. I just think of it as part of the remodeling expense. The dog goes on Friday. Then there’s the weekend. Honestly, I don’t really want to travel, but it is kind of necessary that we be out of the house for the epoxy to dry properly. I think this is a little of the depression talking. More and more Paxil and no real improvement. Maybe the Geodon prevents it? I don’t know. Anxiety over this kitchen is driving me to (want) to drink!